WANT TO GET YOUR CEMENT OR TERRACOTTA TILES BACK UP TO THEIR FORMER GLORY? Restoration and maintenance on your roof can keep it looking great. Eventually, however, the roof will need replacing. Roof Seal® offer a full range of roof replacement materials in iron, cement tile and terracotta tiles. Whenever a home is designed, the frame work is engineered to carry a certain load. To this end it is usually not possible to replace an iron, corrugated roof with a tiled roof without major structural alterations. You can, however, replace a tiled roof with an iron roof if you wish. When looking at replacing your roof always be aware of the load that the structure is supporting and replace with a like or lighter material. Both Cement and Terracotta roofs have been around for years. 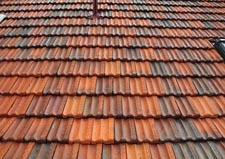 In simple terms the cement tile is made from a cement mould and then painted, a terracotta roof is made from clay with the natural colours being evident. In some cases terracotta tiles are glazed much like a vase or garden pot. 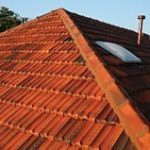 The technological improvements in manufacture have improved the performance in all types of tiles over the years, so when changing a tiled roof you can be comfortable in knowing it will probably not need to be done again. In our experience we have found tiled roofs over seventy years old need re-roofing. Roofs younger than this may also need replacing depending on a variety of factors. The environment, for one, has an influence on the longevity of the roof. In areas close to the sea, for example, there is evidence of perishing, from the under side of older terracotta tiles. In some cement tiles the tile may look fine from the outside, however the covered water course may have weathered away. Contact Roof Seal® for an on-site inspection to advise you of what’s right for your roof and guttering.